LITTLEROCK – John Lanell Fitzpatrick never went to high school. He got involved in the ‘gangster life’ when he was just a boy. In 2009, he was convicted of robbery, unlawful imprisonment with a firearm, and attempting to elude a police vehicle. So when the 46-year-old inmate at Cedar Creek Corrections Center found out he was the recipient of a $12,000 scholarship from the Mike Rowe Works Foundation, he was dumbfounded. His plan is to use the scholarship to attend West Coast Training technical school in Woodland, Wash. after his release date in 2018. He will be enrolling in the cranes, heavy equipment and trucks program. According to the U.S. Bureau of Labor Statistics, heavy machinery operators are projected to see a 10 percent increase in job growth through the year 2024, and have a median pay of $21.65 per hour. The mikeroweWORKS Foundation is a charitable organization that gives scholarships to people seeking job training in the skilled trades. It’s headed by actor Mike Rowe, host of the TV show Dirty Jobs, which profiles occupations most people would consider unpleasant. According to the foundation’s website, the number of skilled trades jobs are on the rise, but there aren’t enough qualified applicants to fill them. This year, the foundation raised more than $900,000 in scholarship funds from corporations and public donations. Fitzpatrick was one of 245 people in the country to receive a scholarship. Fitzpatrick says incarceration was one of the best things that ever happened to him because that’s where he discovered education and his desired career. Like all inmates in Washington state correctional facilities, he was required to have a GED to participate in work programs at the prison. While taking the GED prep course, he discovered he loved learning. In 2013, the nonprofit think tank RAND Corporation found inmates who participated in correctional education programs were 43 percent less likely to return to prison than those who did not. 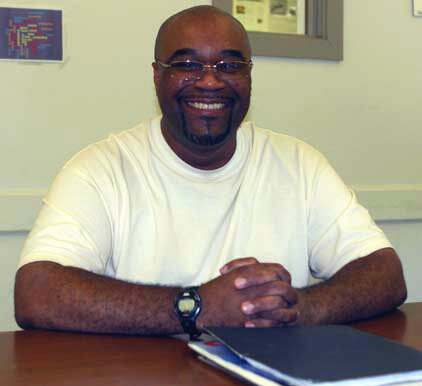 Fitzpatrick’s newfound thirst for knowledge led him to begin a college correspondence course to earn a certification in wastewater management and get training through the prison’s wastewater treatment facility. He was hoping to eventually work at a wastewater treatment facility after his release. However, Fitzpatrick found he was allergic to the latex in the gloves required for the job. “I had to think of a new career path,” he said. Fitzpatrick took a college readiness course at the prison through Centralia College. While taking the class, he looked over brochures for various schools and found the one for West Coast Training. When he saw the picture of the tall metal cranes in the brochure, he got excited. Fitzpatrick knew coming out of prison, he would have no income, so he decided to explore the idea of scholarships. The information packet West Coast Training sent him had a flyer advertising a scholarship. After some encouragement from Centralia College correctional education staff, he decided to apply. The application process turned out to be long, arduous and involved several rounds of essay submissions. One of the essays required a 1,500 word count. With each essay, Fitzpatrick looked to the prison education staff to help him edit and refine his work. Since inmates don’t have access to the internet, he had to rely on staff to submit his application materials. About halfway through the application process he discovered the scholarship was from the mikeroweWORKS Foundation and required a video (video) application. Per DOC policy, inmates cannot have video equipment. However, one of the facility’s employees had an agency-approved camera with video capabilities and Matthew Re, a volunteer facilitator of the prison's drug and alcohol recovery program, decided to help. Re, with the superintendent’s approval, shot and edited the three-minute video. Fitzpatrick even began writing a journal to document his thoughts and actions for other inmates after his release. Education staff submitted the video and final application documents by the application deadline, which was at the end of March. Scholarship applicants would find out if they received the scholarship in late July. August came. Still nothing. One evening near end of the month, Fitzpatrick was walking to the dining hall for dinner. He saw Erika Strong, one of the contractual program monitors, staring at him and tapping her foot. A couple of corrections officers stood nearby and Fitzpatrick thought he was in trouble. Then she handed him a piece of paper. “I look at it and just, ‘bam!’” Fitzpatrick recalled. It was a letter from the mikeroweWORKS Foundation saying he’d been selected to receive a scholarship—in the amount of $12,000. He said he was so emotional he almost started crying. Fitzpatrick said the scholarship didn’t just open doors to a higher education. It also opened the door to communication with his three daughters, who are between the ages of 12 and 18. His eldest daughter is about to graduate high school and wants to go to medical school to become a doctor. Fitzpatrick says they talk often about applying to colleges and looking for scholarships. As he counts down the months before his release date, he’s going to finish his journal about applying for colleges and scholarships. He hopes it might inspire other inmates that education is possible. View John Fitzpatrick’s scholarship video application on YouTube (video).